If you’re a little like me, you will probably enjoy this soap as much as I will. Until recently, I’ve exclusively been using the bathtub in my parents‘ bathroom. Common side effect: dry skin, because of all the hot water. And bathing (for me, at least) means that the entire body is supposed to be submerged in water, which results in a lot of waste water. So I’ve started showering. Bought a lot of different showering gels but still haven’t found one that is moisturizing for the skin AND soothes your entire being by releasing relaxing essential oils. I don’t know how it is where you live.. 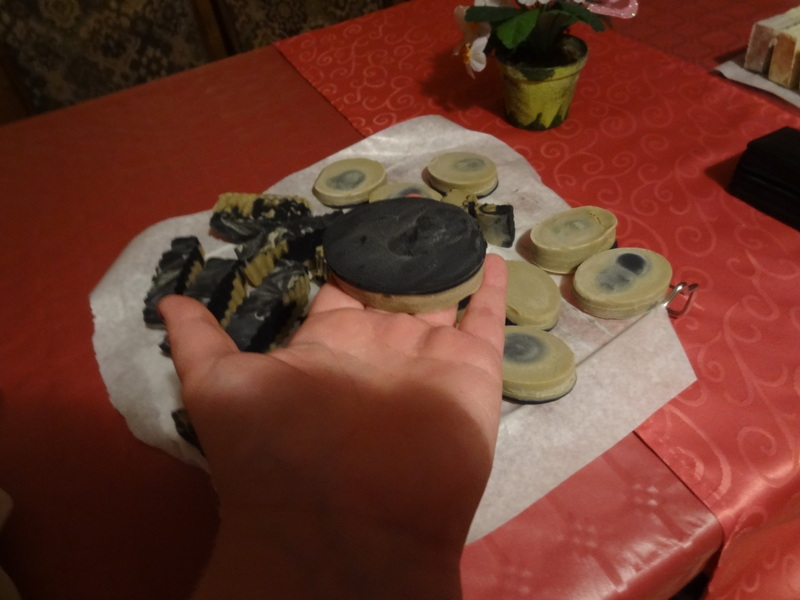 But in my region of Germany, activated charcoal is used mainly as a filtering agent. For example for filtering particulates and pollen from air filters; removing the calcium carbonate from hard tap water – chlorine and ozone as well; to purge pollutants from fish tanks and ponds.. It’s really quite helpful. When ingested, it also bonds with toxins in the gastrointestinal tract and removes them safely. This is where I got my idea.. because you can buy those little black pills made from pressed activated charcoal basically in every drug store. Just make sure it is really 100% charcoal and no additives. Then use a mortar and grind up as many pills as needed. 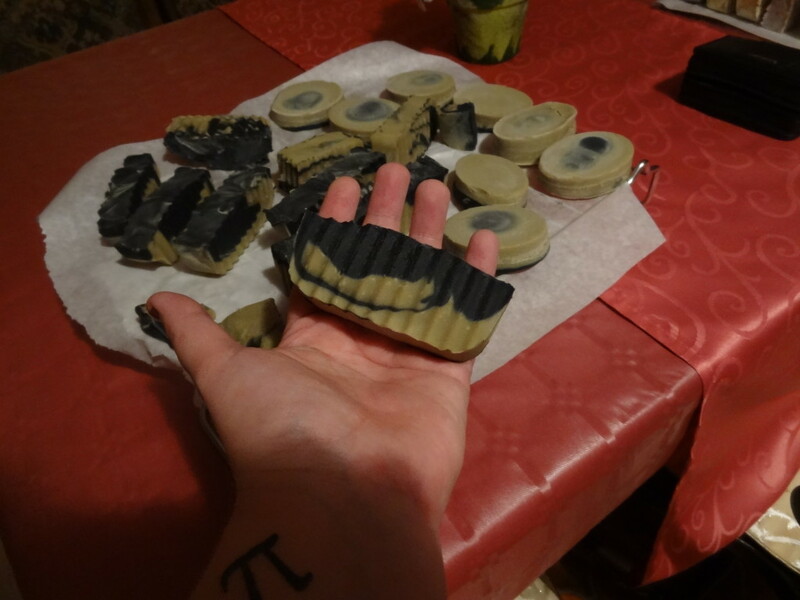 Activated Charcoal will color the soap batter black. Or a dark-ish gray. It is also an excellent exfoliant. American soap recipes use stuff like dead sea mud (You can buy dead sea salt.. but that’s not even close), bentonite clay.. or rose clay. Good look finding that here. Last week I finally found an online shop that sells it. But it’s not based in Germany. 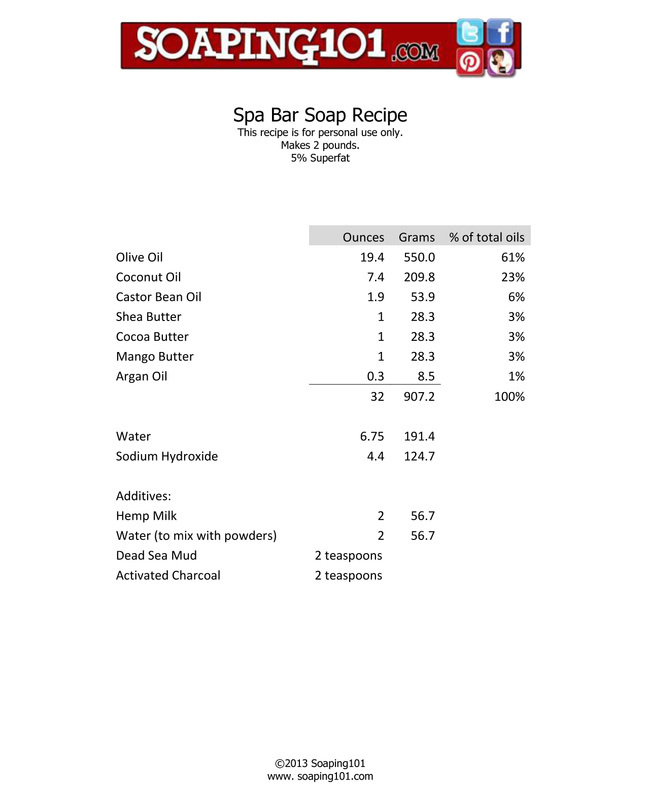 And when I soaped this recipe, I didn’t know about the shop yet. So I had to look for alternatives. The Spa Bar recipe calls for dead sea mud. The dead sea mud has detoxifying properties and is known to help people with psoriasis, acne and other skin conditions. It balances out the PH level of the skin and helps to remove excess sebum from the skin. Something with similar properties is called „Heilerde“ (lit. „Healing Earth“) and can be ingested or (as a paste) put on the skin. I bought Luvos Heilerde „hautfein“. Heilerde is a loess, containing silicate, calcite, clay, feldspar, dolomite and others. Is a plant-based milk that’s produced like almond milk, soy milk or oat milk. Since I couldn’t find it anywhere, I substituted oat milk. Add lye solution and stick blend until emulsified.